One of the major stops on both the Trans-Mongolian and the Trans-Siberian is Irkutsk; it is located a little less than halfway across Russia. Irkutsk is the rail stop if you want to visit Lake Baikal, the largest, oldest, and deepest freshwater lake in the world. Lake Baikal is the reason we chose to stop here, and doing some research, we found Baikal Secrets, a local travel company that specializes in things to do while in Irkutsk. Arriving in Irkutsk during a dreary rainy snow storm, we disembarked and headed to our hotel, Inn 777. We decided to leg it there, which is about 2 miles from the train station. It was a cold and wet walk that culminated in a locked door at Inn 777. We had a short freakout that we were in the wrong place before someone came out and let us in and we deposited our stuff in the room. We decided, after asking Nate and Matt, that we would schedule an Olkhon Island tour with Baikal Secrets for our first day and if we had the inclination, visit the lake via taxi the second day. Ivan agreed to pick us up at 6:30 am to head to Olkhon Island, which would work out perfectly as we were due to arrive into Irkutsk sometime in the neighborhood of 4:00 am. The problem that arises with Russian train travel is, all trains are run on Moscow time, a six-hour difference from Irkutsk; we did not arrive until 10:30 am. Also, for some reason, my Google Fi was not letting me connect to a data network so I could not get in touch with Ivan. The first thing I did upon our arrival to Inn 777 was to get on the wifi to email Ivan with Baikal Secrets to let him know of our mistake. Awaiting me in my inbox was an email from him to let us know he tried to pick us up and we were not at our hotel nor Matt and Nate at theirs. A bit of back and forth with him about what options we had left and decision making, we all decided to do the one-day Listvyanka Tour. Ivan came back to pick us up, we skated across town to pick up Nate and Matt then we were on our way to Lake Baikal, albeit a few hours later than expected. I should also add that I told Matt and Nate we were headed over, when we got there we still had to wait about ten minutes before they came out, they are the worst. The drive to Lake Baikal takes about an hour and a half from Irkutsk but, on the way, we stopped at Taltsy Museum. 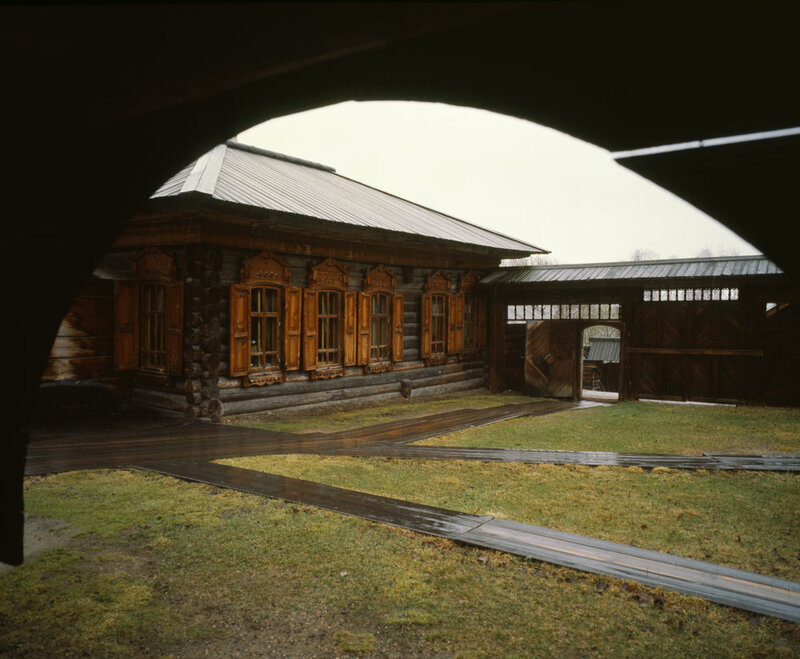 Taltsy is an open museum of various wood structures that demonstrate what life was like in Siberia in the 17th century. This was somewhat of a surprise stop for us, as Ivan was trying to make the most of our truncated day. Turns out, Taltsy was very interesting and well worth the stop here. I should also add that for this whole day it was raining. We spent about an hour or so all told at Taltsy and then back in the car to head to Lake Baikal. Ivan answered all the questions each of us had, except for Nate's, because he was sleeping in the car. We hiked back down after the dismal view with Lake Baikal and Listvyanka in our sights. Driving towards Listvyanka we caught our first glimpse of the lake and it was gorgeous. While it was still overcast, I really felt the massiveness of the lake. Ice breakup had occured about three weeks before we arrived, but the edges still had small ice formations on them; it was extremely cold. Listvyanka is situated right on the shores of Lake Baikal and has quite a few things to do while in town: hovercraft and boating on the lake, fishing, all-terrain vehicle rentals, as well as bike rentals, are available. We went to the market and got lunch. A lot of the stalls sell Omul, an endemic fish to Baikal. Ivan bought a few and so did Nate, which he shared with me; I thought they were very good. The whole day with Baikal Secrets and Ivan was a great way to spend the day, see the lake, and enjoy some fish. Ivan was absolutely wonderful and I would not hesitate to recommend him to others visiting. The cost of the day was 3000₽ or about $50.00 each. I thought it was well worth the price we paid. On the way back to Irkutsk, he stopped at a flower shop to buy flowers for his Grammies birthday, Happy Birthday, Grammies! Carmen and I tried to find a vegetarian place after we got back however, the business we walked to had changed and was no longer vegetarian. We got food at a market and spent the rest of the night in the hotel. Our plans for Irkutsk were only concrete for the first day with the idea that we could go back to Baikal the second day if we liked it. We figured if Ivan or someone spoke very highly of the Circum-Baikal Railway, for example, we would plan to do that the second day. The overcast first day permeated into the second, this led us to just hanging around town. Carmen and I decided that walking to the river, the Angara River, would be a good way to spend the day. Along the way to the river, we passed a statue of a Siberian Tiger with a Sable in its mouth. This statue is a representation of the coat of arms of Irkutsk. We also got donuts at a little shop near the statue, Crispy Donuts. The donut I got was so sweet and delicious. The walk to the river was nice, albeit a little wet. We walked along a nice river walk that most European and Asian cities have. We saw locals fishing, people strolling with their significant others, bikers, and every other sort of thing you expect to see on a river walk. Irkutsk also has some nice indoor and outdoor markets. We purchased most of our food at markets, as a matter of fact, I do not think we went to a restaurant the whole time we were here. We ended up spending a good deal of this day back at the hotel, watching movies on the computer and surfing the web. The cold, dreary weather was a good excuse to relax back at our hotel. Our last day here was like the rest, cold and rainy. Our train was leaving Irkutsk at 11:15 am Moscow time, which meant we had the entire day, until 5:15 pm to get to the station. We checked out of our hotel the latest we could and wandered over to Matt and Nate's hotel, the Baikaler. Matt was staying an extra day in Irkutsk for some reason, so he had the hotel for an extra night. The employee at his hotel, Eve, was the direct opposite of our hotel staff; she was bright, funny, and enjoyable to talk to. She let us hang around until we went to the station. We did pick up some noodles and snacks for our upcoming three-day train ride before we walked to the station. That long of a ride, even though you can buy on the station and the train, it is nice to have more options for eating, and getting those at the market is a great option. While Irkutsk does have a tram system, a bus system, and taxis all over, we chose to leg it over to the train station, a little over a mile walk. Matt joined us as he had nothing else to do. Our train arrived on time and we boarded, ready to spend three days and 3 hours on the 001m to Moscow. Irkutsk is a stop on both the Trans-Mongolian and the Trans-Siberian, and I'd suggest if you're ever on either of these routes, that you stop here. There are numerous things to do, whichever season you decide to make your trip. Lake Baikal was immense and interesting, with plenty of activities to do both in summer and winter. If you do happen to make it here, I'd highly recommend Baikal Secrets. Ivan showed us a great time even though we had a small hiccup in our original plans. His English was impeccable and prices are very reasonable.